The looming storm, No. 2 in a triple-header for the Bay Area, is expected to slam areas in southern Santa Clara County again, just as last week's torrent flooded areas in Morgan Hill, Gilroy and Hollister. And those who escaped those floods aren't feeling as lucky this time. Residents were stocking up on free sand bags, hoping to block what could be fast moving water toward their homes. If the water happens to rise too high, they say even the sandbags won't help. "It's never been this bad before," said one Morgan Hill resident named Nick. Last weekend, Nick's home quickly became waterfront property, as a once dry field in front of his house was pounded with rain and within hours turned into a lake. "The intersection was closed, this whole road was closed and completely underwater," he said. 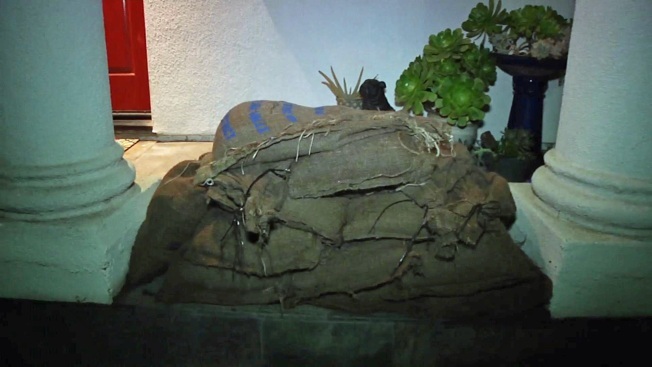 On Thursday, he was building a sandbag wall at his home, just in case the latest round of rain is a repeat. Nick's street isn't the only area of concern for people living in Morgan Hill. There's a long list of hot spots where homeowners are advised to protect their property. And after the last storm lesson, some aren't waiting until the last minute. "I kept all my sandbags, and I'm ready," Nick said. "Hopefully, the water doesn't come to the door or behind the house." The rain was due to hit some areas in the region late Thursday night and continue well into Friday. Free sandbags were available in multiple locations throughout the area.